January 20, 2014 By Tina M 29 Comments This post may contain affiliate links. Read my disclosure policy here. This post is for informational purposes only and is not intended as medical advice. When Little #2 was two months old, she was diagnosed with Plageocephaly (flat head) and infant torticollis (favors turning head to one side). We were told that unless it was corrected she would need to get fitted for infant helmet therapy by six months old. 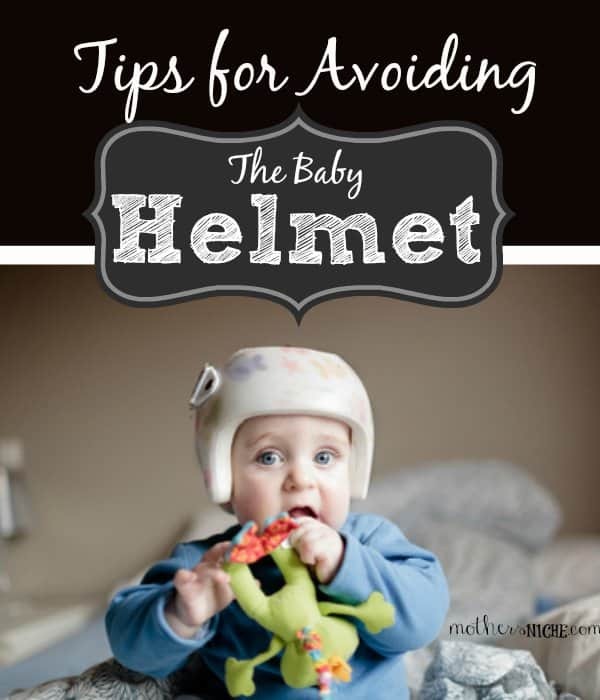 I personally think those little babies in helmets are adorable, but it’s not too fun for baby. We would also have to travel 2 hours every time it needed to be adjusted, so we were very interested in avoiding the helmet completely. Lucky for us, the specialist that we went to had a daughter with the same thing and he knew of some great ways to avoid helmet therapy. With all the latest recommendations to lay babies on their back due to SIDS, plageocephaly is becoming more and more common in babies. Because of this, I thought I would pass on the recommendations that our doctor gave us. Update: we went back at 6 months and she did not have to get a helmet. Hooray! Because babies’ head are still moldable when they are infants, it’s best to follow these tips when they are only a couple of months old. Avoid Long Amounts of Time on the Back. Because I also had a busy toddler when #2 was born, I would set her down more than I did with #1. Once we discovered her flattening head, we got creative about some ways to keep her upright without having to hold her 24/7. This is best done with the Bumbo (she could sit in hers by 3 months), and various baby carriers (Something like the Moby when they are infants, and just a regular carrier once they can hold their head up). Put the crib against a boring wall and place a musical, flashing toy on the other end. After my daughter was diagnosed and as I left the doctor’s office, he said…”Doctor’s orders: Go straight to Babies R US and get a crib toy!” This is especially important for babies that favor turning their head to a specific side. Rather than placing a mobile in the crib which gets them to look up, place a crib toy onto the railing (preferably one with music, lights and movement), to get them to turn their head the opposite direction than they are used to. This will help stretch out the neck muscles so that they don’t favor one specific direction anymore. Make sure the other side of the crib is pushed up against a boring wall so that they will naturally be enticed to look over at the toy instead. Stretch the Neck Muscles. This tip was my favorite because our baby loved it. Our doctor had told us to hold her in a certain position (pictured below), so that her neck was being stretched anytime she was being held. He instructed us to switch off sides so that she got stretched equally in both directions. Something we wish we had used before there was even an issue in the first place, was to use a baby noggin. My sister told me about the product, and it’s for protecting baby’s head shape while they are awake in their swing, bouncy seat, stroller, etc.! This is something I’m considering giving at baby showers just because so many babies are getting flat heads these days! Just make sure not to use it while they are sleeping as they could get their face stuck against the bumper or something! Don’t forget belly time, a few times a day for 3-5 minutes, it helps them develop motor skills and neck muscles. 🙂 yep! Tummy time is great! hi, my son is 4 months now and we have just come aware of his flat head on one side. I would say it is moderate! I just wondered if you think I should sick help or follow your suggestions and see if it helps. I’m a nicu nurse and am strongly urging you to take the info about the noggin down. By placing anything other than the head rest that came with the car seat, parents are inadvertently voiding the warrenty. Not only will car seats not back up their product after an emergency occurs, but many insurance companies may fight paying for care at all if any additional products are placed in the seat. This also includes strap covers, snowsuits, coats, those winter snuggles that sit in the seat(the name escapes me), etc. even in strollers, etc, the noggin can pose a risk more than a help. I’m very impressed with the rest of the post, but I spend most of my time explaining why all these extras are not good for babies. Erin, I never recommended using it with a car seat…only bouncers, swings and strollers as the product suggests. I would not think it wise to use it in the car seat either! Are you against using it outside of the car seat? Yes, we don’t recommend using it at all. I’ve got to be honest, it’s because of the “bad apple” parents. The ones who hurt their child this causing havoc for the rest. My sister actually purchased head rest similar to the noggin for inside the house/stroller/etc and when I balked, she reminded me that not every parent is stupid. But most of them don’t know safe one place isn’t safe in another. Make sense? Haha! Mauraea, I agree. I’ve been debating taking it down, but at the same time I’ve heard how helpful is has been for parents. I think I will add an extra word of caution not to use it in car seats and let parents make the choice. There’s many that would say not to buy the Bumbo, but if used correctly I personally find it to be a lifesaver when you have a baby that can’t quite sit up and doesn’t want to lay down. Mauraea: Amen! I love your comment. I always used the little pillows that prevented roll over and had them sleep on their side. I would constantly change the side they slept on. Ours hated the tummy time also. They didn’t sleep without the pillow until they were several months old. This is great, however the carrier that you recommended is not good for the baby’s hips. The Moby is excellent, but the other one does not properly support the hips and can increase the risk of hip dysplasia. It’s also not good for their spine, and is hard on the parent’s back because of the alignment. A good carrier has baby facing inward, and has their legs in “froggy” position (the way they would be if you had baby propped on your hip) for proper support and alignment. I am a pediatric PT who sees lots of plagiocephaly, torticollis, you name it. We never recommend additions to positioners since it further results in range of motion restrictions in devices like swings and bouncy seats. All positioners can make the head shape and torticollis worse since they aren’t strong enough at this age to hold their heads against gravity yet. Limit these to 15 minutes per day (for kids with existing conditions). And see Jen’s comment above if you want more reason for positioners to be off shelves all together. Pillows while sleeping to position are NEVER recommended. Floor time is always best where they can move freely and develop their gross motor skills, which will be the ultimate reason the head shape changes – movement. I’m so confused! My 7 week old was just diagnosed with torticollis and had her first PT appointment today. 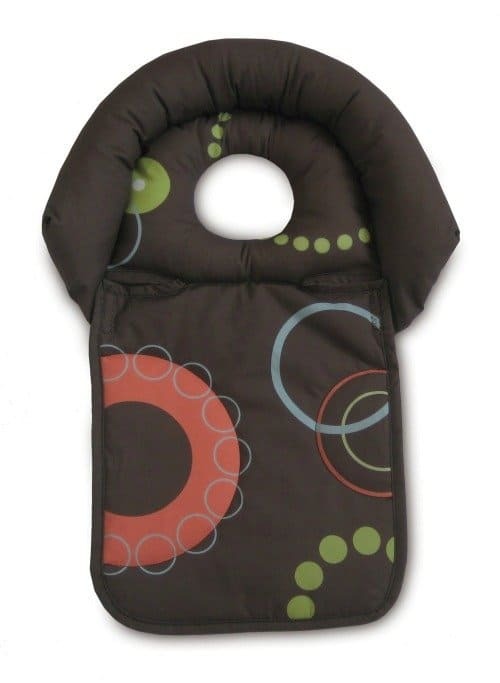 The therapist recommended a product called “baby elephant ears” to use in the car seat, swing, bouncy, ect to keep her from leaning to her right. She also recommends propping my daughter on her side when she sleeps and alternating sides so she doesn’t get flat head. Are you saying these recommendations are no good? Sarah, are you saying better to just have babies in the swing or bouncy seat without it and just dedicate more time to floor play? 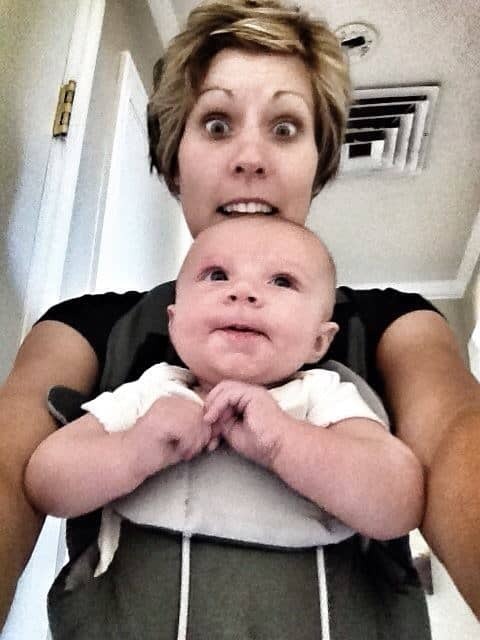 I used the head noggin in the car seat and it helped alot. Kept his head nestled nicely and off the hard back. I also let him sleep on his side and with a moon pillow. All things we aren’t supppsed to do… BUT HE WAS SUPERVISED AT ALL TIMES DURING THIS! He was held alot, plenty of tummy time, never in swings or laid on back for long. His head never got worse and greatly improved. Unfortunately, We still ended up getting him a helmet at 6 mnths. Maybe being born early it was inevitable.. Good news is he only has to wear for 8-12 wks..
Good luck mothers and remember common sence goes along ways and if you aren’t sure about something don’t do it. 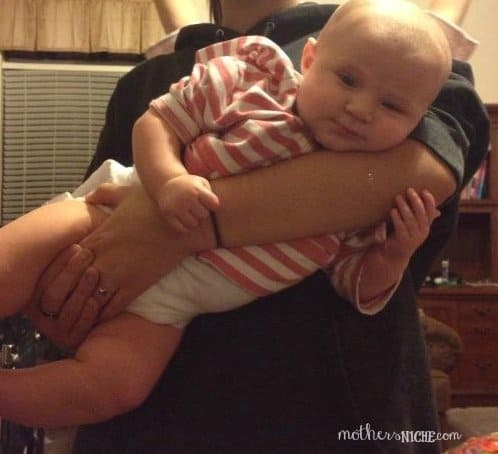 How about instead of bouncy seats, swings, car seats & bumbo seats just hold your baby? They will only be babies a short time. Everything else can wait.,I lugged around a four year old & a newborn. It wasn’t hard. I concur… not every mother can lug their baby around with them, I surely wouldn’t put my daughter in harms way while cooking, or have her around the bathroom while cleaning. I just want to say thank you for sharing these tips! My daughter has this same exact issue and the doctor recommended at her 2 month visit to start massaging her neck to help strenghten her neck muscle. She is not a fan of tummy time… But I have the same play may so I’m going to use that to encourage the tummy time. And I have no idea why I didn’t think of a crib toy!!!! This has been such a help! Thanks again! Lol did you by chance see dr fairbanks?? Sounds like the exact advice he gave us. Great to see it works because we are in the exact situation! A pediatric chiropractor could help tremendously with this! Doing #1 and #2 along with gentle adjustments will help baby stay healthy with a beautiful head shape! I would recommend the new Lifenest mattress. This low pressure mattress cradle the baby’s head reducing teh pressure on the soft spot. It is already marketed in Europe as a treatment for Deformational Plagiocephaly. Also, the Lifenest mattress is breathable, it helps prevent suffocation if the baby accidentally rolls onto his/her stomach. Many US hospital NICUs/PICUs have implemented the hospital version of the Lifenest mattress. I’m so glad it worked for you! I did everything I could to avoid the helmet and the PT said that she saw a lot of improvement in the flat spot, but my daughters ears are out of alignment so they are recommending we go ahead with the helmet. I’m trying to view it like braces and I’m going to try to be even more vigilant whenever baby number 2 comes around. I feel like this issue is one of those where it sure is hard not to feel like a bad Mom if your little one needs one! The PT said it was more likely due to the fact by daugher was head down for basically the whole last trimester but it still makes you feel terrible! Do you have any pictures on where you placed your soother and placed your baby for positioning? So did your baby’s head correct itself with those tips?